If you live in a concrete jungle or if you have a small area, chances are you feel discouraged to pursue gardening as a hobby. Thankfully, there are many crops that thrive in pots. And if you love hot and spicy food, one of the perfect options for container gardening is the jalapeno. Please read on if you want to learn more about growing jalapenos in pots. While Jalapeno originally came from the town of Jalapa in Mexico, it got its way to the US and it has now become one of the most popular hot pepper varieties in the country. Jalapeno produces thick-walled and moderately hot pods that are initially green in color and matures into bright red. These pods are rich in vitamins A, B6, C, and K. Also, its hotness is caused by the presence of capsaicin which is an excellent anti-inflammatory substance. Capsaicin also aids in preventing sinus problems and in burning fats. Depending on the variety you are planting, Jalapeno fruits may grow in size between 2 and 3.5 inches long. Adding Jalapenos in a dish creates a spicy and delicious flavor. Its hotness is anywhere between 2,500 to 10,000 Scoville units depending on the variety. Because of this, Jalapeno is widely used in many cuisines. It is commonly used in salsa, sauces, pickles, wraps and nachos among others. Soil requirement: Well-drained soil that is rich in nutrients. If you are planting Jalapenos directly in your garden soil, try to add 3 to 5 inches of compost and other organic matter before planting. The pH level of the soil should be between 6.2 and 7.0. Water requirements: Keep the soil moist. Mulch can help in reducing water evaporation. Jalapenos are also good with an inch of water every week but make sure not to let the soil become waterlogged. Common issues: Flowers drop when daytime temperature is above 90 degree (F). Also, look out for pests such as slugs, aphids, leafminers and pill bugs as they are attracted to Jalapenos. If the weather is humid, this plant may develop leafspots and other fungal diseases. Fertilizer: Jalapenos do well with organic fertilizers. If none is available, you could also use a 10-10-10 standard NPK fertilizer to feed the plants. Just follow the direction on how much fertilizer to add so that you’ll not accidentally overuse and burn them. Containers – You’ll need four different sizes of containers for planting Jalapenos in pots. The smallest one is for growing the seeds. You also need containers that are about 3 to 5 inches in diameter. The big ones should be at least 2 gallons in size and they will serve as final planters. If you have empty plastic water bottles at home, you can recycle them to grow your seeds. Soil – Jalapenos are heavy feeders so they require a good potting mix. Adding organic fertilizer from time to time also boosts their growth. But for growing the seeds, you’ll need a starter soil. Start to grow the seeds indoors for about 6 weeks before your expected last frost. For most areas, this could be anytime between January and March. 1. Drill a hole at the bottom of each container and fill them with sterile seed-starting soil. 2. Seedlings are fragile so water them just enough to moisten the soil. 3. Create small holes about ¼ inch deep and then drop 2 to 3 seeds in it. 4. Cover the hole with soil and then position the container in an area with relatively low light. 5. Keep the soil evenly moist. 6. If the conditions are all favorable, the seeds should start to germinate in 14 to 21 days. 7. If the soil dries out too quickly, you can drape a plastic wrap (loosely) over the container. Doing this will help stabilize the moisture level, allowing the seeds to germinate faster. Keep the containers indoors until after the threats of frost pass. 1. Once the seeds start to sprout, move them to a well-lit and warm area. Do not expose the seeds to temperatures lower than 65 degrees F. If available, south facing windowsills are a good place to put your containers. If not, you can also use artificial grow lighting. 2. Spray the soil with water from time to time, making sure that the soil is moist. It’s not good to overwater the Jalapenos as they easily develop root rot when the soil is waterlogged. 3. Seedlings require at least 12 hours of direct exposure to sunlight. Note: You can skip up to this part if you are not growing from seeds but are buying your seedlings from a nursery. Day 14 – On the 14th day from the time you plant the seeds or when the seedlings are already at least 2 inches tall with at least 4 leaves, the Jalapenos should be ready for their first transplant. Fill the 3-inch diameter containers with potting mix and then transplant the seedlings. Day 35 - Transplant from a 3-inch diameter container to a 5-inch diameter container. Day 60 - Transplant from a 5-inch diameter container to the final planter. 1. Once you have transplanted the Jalapeno plants to the final planter, it’s time to bring them outdoors. Before you do, make sure that you already harden off the plants as this is important for their overall growth. You can harden off Jalapenos by letting a small fan blow on them for several hours daily. You may also gently hold the stems and then move them in all sides to thicken up. Also, the best time to do move the containers outdoors is after two or more weeks after the last potential frost. 2. Maturing Jalapenos would need at least 8 hours of exposure to direct sunlight daily. 3. Maturing Jalapenos also love a moist soil. Water the plant daily but make sure not to overwater them to avoid root rot. 4. If you are using a premium potting mix, you don’t have to fertilize within a month of transferring the Jalapenos outdoors. After one month, you can already start adding organic fertilizer to keep the plants healthy until harvest. The best part of planting Jalapenos is to harvest the pods. From seeds to harvest, it could take about 90 to 120 days. You could harvest the Jalapenos earlier if you want them green. The 120-day cycle applies if you are looking to harvest red Jalapenos. Both the green and red Jalapenos are edible and taste good. Harvest when the peppers are still green as this will force more flowers to bloom and more peppers to harvest. Use shears or cutting knife when harvesting peppers. Picking them by hands may cause the entire branch to break off. For longevity during storage, keep the fruits attached to the stems. For best flavor and nutrition, use the Jalapenos within a week from harvesting. Growing Jalapenos in pots is very possible and is not that difficult at all. Just follow the procedures we have listed above and you are good to go. Jalapenos are sensitive to overwatering so this is something you should watch out for. Also, this plant grows well with more hours of direct exposure to the sun. That means you must carefully plan where to position the pots. 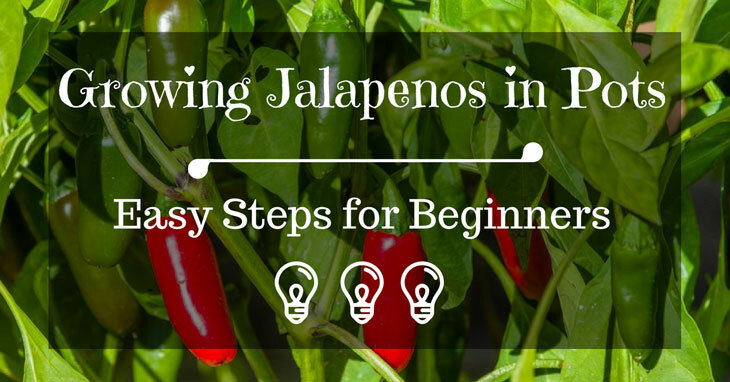 Do you plan to grow Jalapenos anytime soon? If you do, please let us know if you have questions that we could help you with. Also, don’t forget to share this article with someone you know who might benefit from it. How to Identify Male and Female Bell Peppers?